"This was our favorite drink on our honeymoon in St. Lucia. When we returned, we took a shot at recreating it, and it worked!" 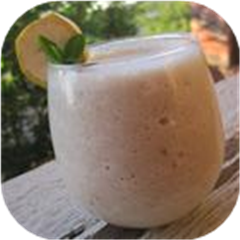 In a blender combine the bananas and banana liqueur; blend until smooth. Blend in the Irish cream and coconut cream (Note: Make sure the coconut cream is at room temperature, or you will not be able to pour it). Finally, add the ice and blend until smooth.